More than a vineyard. Celebrate, convene, entertain or dine in one of Newport County’s most unique venues. 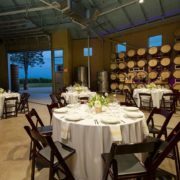 From rehearsal dinners, showers or intimate weddings, to corporate events, galas or anniversary celebrations Newport Vineyards offers distinctive event spaces all surrounded by a historic vineyard crafted by the sea. Situated amongst 50-acres, yet just minutes from downtown Newport, our location offers ample parking, is easily accessible from Newport or Providence, and is just over an hour from Boston and 3.5 hours from New York City. Looking for a venue for a rehearsal dinner, welcome reception, shower or post-wedding brunch? Surrounded by acres of vines, make your celebrations memorable with one of Newport County’s most unique venues. Below you will find a list of available dates and the venue space available. *Please inquire for current availability.